With 10 inch rebrowned scratch rifled twist octagonal sighted barrels signed in gold and with a gold band at the rear of each breech, gold-lined touch-holes, finely engraved case-hardened tangs, signed case-hardened bevelled detented locks each with stepped tail, blued safety-catch also locking the steel, blued steel-spring fitted with roller, semi-rainproof pan, and original blued finish on the internal working parts, figured walnut full stocks, swelling butts cut with chequering apart from a narrow flat strip on each side, finely engraved blued iron mounts including trigger-guards with large pineapple finial, original horn-tipped ramrods, and much original finish: in original lined and fitted brass-bound mahogany case with accessories including three-way flask covered in leather stained in imitation of tortoiseshell, the interior of the lid with the stamp of ‘J. Holmes/Gun Maker/ 5, Market Square, Penrith.’, the exterior with flush-fitting brass carrying handle made in one with a circular escutcheon, London proof marks. 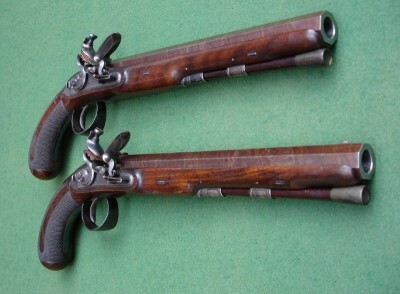 These pistols probably belonged to James Lowther (1736-1802), 1st Earl of Lonsdale (created 1784), and 4th Viscount Lonsdale, landowner and politician. Described by Thomas Carlyle as “truly a madman, though too rich to be confined”, he had a reputation for meanness and violence, and fought a number of duels, including one against Captain Cuthbert on 9 June 1792 (recorded by Andrew Steinmetz, The Romance of Duelling in all Times and Countries, vol. II, pp. 46-7). His main title lapsed on his death without issue, but that of Viscount Lonsdale passed to his relative Sir William Lowther. Provenance:The Earls of Lonsdale, Lowther Castle, Cumberland (probably in the house sale conducted by Maple & Co. and Thomas Wyatt, F.V.A., 16 April 1947). The William Keith Neal Collection. Literature:W. Keith Neal and D.H.L. Back, The Mantons: Gunmakers, pp. 10, 73. D.H.L. Back, The Mantons 1782-1878, p. 25, plate 13.